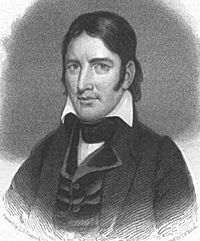 David Crockett (David de Crocketagne, August 17, 1786 – March 6, 1836) was a nineteenth-century American folk hero usually referred to as Davy Crockett and by the popular title "King of the Wild Frontier." He represented Tennessee in the United States Congress, served in the Texas revolution, and died at the Battle of the Alamo. Crockett had no formal education, yet he possessed oratorical skills that combined with his common sense approach and his fearlessness, made him one of the most popular personalities of his era. For many he embodied the quintessential spirit of a true American. Crockett was born near the Nolichucky River in Greene County, Tennessee. Descended from Ulster-Scots, he was the fifth of nine children of John and Rebecca Hawkins Crockett. He was named David after his paternal grandfather, who was killed by hostile Indians at his home in present-day Rogersville, Tennessee. His father was a descendant of Huguenot ancestors who had emigrated from France to England, Ireland, and America. In America, their migration continued from Maryland to Virginia, North Carolina, Tennessee and Texas. Their name was originally spelled Crocketagne, and the progenitor of the American Crocketts had been the second in command of the Home Guard for Louis, King of France. Crockett was engaged to marry Margaret Elder in 1805, but the marriage never took place. The bride ran out on the wedding and married someone else. On August 12, 1806, Crockett married Polly Finley (1788-1815). Their first child, John, was born July 10, 1807, followed by William (born 1809) and a daughter Margaret. On September 24, 1813, he enlisted in the Second Regiment of Tennessee Volunteer Mounted Riflemen for 90 days and served under Colonel John Coffee in the Creek War. He was discharged from service on March 27, 1815. Soon after he returned from service, Polly died. Crockett remarried the widow Elizabeth Patton in 1816 and they had three children: Robert, Rebeckah and Matilda. Crockett won the election of lieutenant colonel of the Fifty-seventh Regiment of Militia on March 27, 1818. Mr. Speaker—I have as much respect for the memory of the deceased, and as much sympathy for the sufferings of the living, if suffering there be, as any man in this House, but we must not permit our respect for the dead or our sympathy for a part of the living to lead us into an act of injustice to the balance of the living. I will not go into an argument to prove that Congress has not the power to appropriate this money as an act of charity. Every member upon this floor knows it. We have the right, as individuals, to give away as much of our own money as we please in charity; but as members of Congress we have no right so to appropriate a dollar of the public money. Some eloquent appeals have been made to us upon the ground that it is a debt due the deceased. Mr. Speaker, the deceased lived long after the close of the war; he was in office to the day of his death, and I have never heard that the government was in arrears to him. Every man in this House knows it is not a debt. We cannot, without the grossest corruption, appropriate this money as the payment of a debt. We have not the semblance of authority to appropriate it as charity. Mr. Speaker, I have said we have the right to give as much money of our own as we please. I am the poorest man on this floor. I cannot vote for this bill, but I will give one week's pay to the object, and if every member of Congress will do the same, it will amount to more than the bill asks. In 1834, Crockett’s book titled A Narrative of the Life of David Crockett was published. Crockett went east to promote the book and was narrowly defeated for re-election. In 1835 he was again defeated for re-election, saying, "I told the people of my district that I would serve them as faithfully as I had done; but if not ... you may all go to hell, and I will go to Texas." And he did just that, joining the Texas Revolution. On October 31, 1835, Crockett left Tennessee for Texas, writing, "I want to explore Texas well before I return." He arrived in Nacogdoches, Texas, in early January 1836. On January 14, Crockett and 65 other men signed an oath before Judge John Forbes to the Provisional Government of Texas for six months. "I have taken the oath of government and have enrolled my name as a volunteer and will set out for the Rio Grande in a few days with the volunteers from the United States." Each man was promised about 4,600 acres (19 square kilometers) of land as payment. On February 6, Crockett and about five other men rode into San Antonio de Bexar and camped just outside of the town. They were later greeted by James Bowie and Antonio Menchacha and taken to the home of Don Erasmo Sequin. William Barret Travis was the commander in charge at the siege at the Alamo. His appeal for help has been used as an example of American courage and fortitude. The Texas forces of 180-250 men were overwhelmed by the attacking Mexican soldiers, which were estimated between 1,300 and 1,600 strong. The Mexican commanders understood the superiority of their numbers and position and offered free passage to all concerned. Travis refused to surrender. Legend has it that Crockett went down fighting inside the Alamo compound, but this is as much myth as his play. The actual evidence conflicts with the controversial evidence that has come to light since 1955 (José Enrique de la Peña diary) indicating that there may have been a half dozen or so survivors, with Crockett perhaps among them, taken prisoner by Mexican General Manuel Fernández Castrillón after the battle and summarily executed on orders by Mexican General and President Antonio López de Santa Anna. One of Crockett's sayings, which were published in almanacs between 1835 and 1856 (along with those of Daniel Boone and Kit Carson) was "Be always sure you are right, then go ahead." In 1838 Robert Patton Crockett went to Texas to administer his father's land claim. In 1854, Elizabeth Crockett finally came to Texas where she died in 1860. John Wesley Crockett became a U.S. congressman (the same seat his father held), serving two consecutive terms in office, finally retiring in 1843. Most sources indicate Crockett and all the Alamo defenders were cremated en masse. There were unconfirmed reports that some of the Mexicans who were hired to burn and bury the dead removed Crockett to a secret location and buried him in an unmarked location. Some say that he was secretly transported back to Tennessee to prevent Santa Anna from using his body as a trophy. These are all unconfirmed. 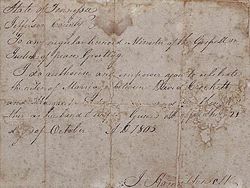 In May 1836, Richard Penn Smith wrote: Colonel Crockett's Exploits and Adventures in Texas and Carey & Hart published this material claiming it was the "authentic diary" of Crockett's taken from the Alamo by a Mexican general who was later killed at the Battle of San Jacinto. In 1884, the book was discovered as a phony after selling thousands of copies. In 1872 a play about Crockett ran for over two thousand performances, ending in 1884 with the death of the lead actor. Popular belief is that he wore a coonskin cap, but this is a myth propagated by the actor who played him in a play he commissioned to raise his flagging popularity. The actor was chosen to play the role of the "great frontiersman" and picked a coonskin hat quite by chance. It is the information from this play that gives us the Disney version of Davy Crockett's life—not the reality of the politician. Davy Crockett named his favorite rifle "old Betsy." It was a gift from the people of Tennessee. When he went to Texas, he left it at his home in Tennessee. "Old Betsy" now resides in the Alamo Chapel in San Antonio. Davy Crockett's tombstone reads: "Davy Crockett, Pioneer, Patriot, Soldier, Trapper, Explorer, State Legislator, Congressman, Martyred at The Alamo. 1786 – 1836." All links retrieved November 9, 2017. This page was last modified on 9 November 2017, at 16:05.